Gong Xi Fatt chai and a Happy “Ssssss” year. 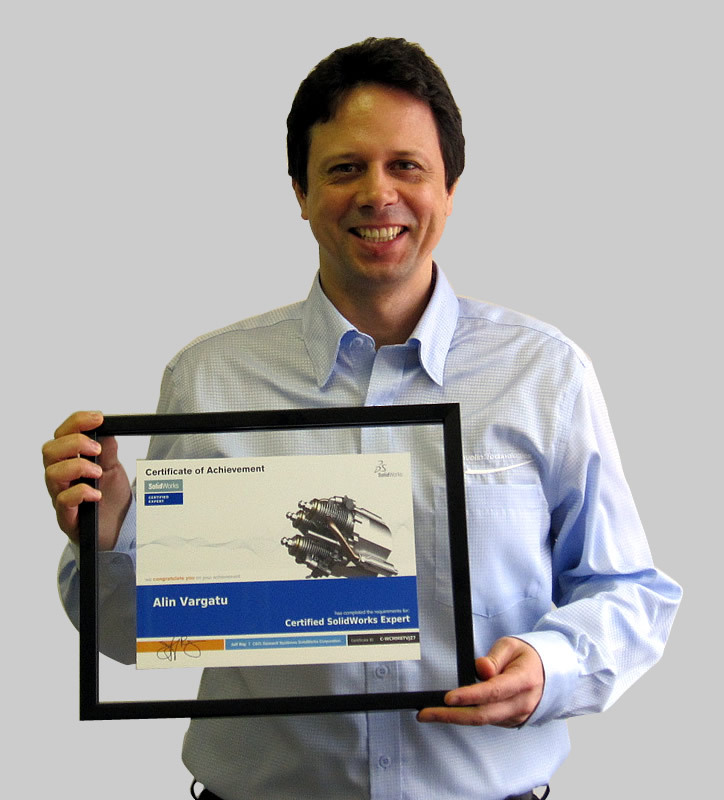 We talked about what is CSWP and the benefits of it to the user with this recognition. Let’s do role changing; now we jump into the employer shoes. Now we are the boss, why would we hire somebody with CSWP compare to other candidate. What is special about them? First, we need to understand that CSWP exam is a challenge to do 3D modeling in advance level in short period of time period. For that, mastering technique and to have deep understood on all the commands is a must. They also need to plan their designing flow carefully as the time constraint plus there will be instantaneous design changes during exam. So, this mean candidate with CSWP is a natural fast designer. They will utilize keyboard shortcuts, mouse gesture shortcuts, rather than dragging mouse, menu to menu, icon to icon in traditional way. They will not take time to zoom or rotate to selected area as the 3D image already been synching from their brain to the desktop. Although this can obtain by years of using SolidWorks, but CSWP will subdue way of designing to this fast stage. 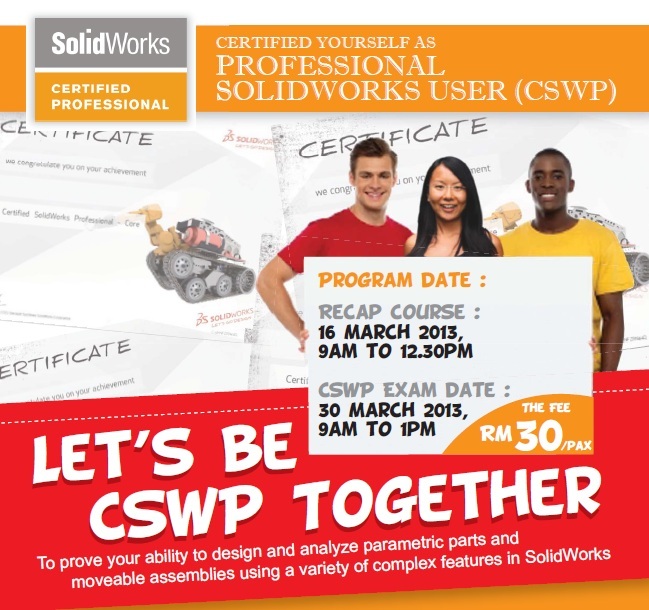 Next, having CSWP means to work with SolidWorks in the ideal way. This is the most overlook concept from employer perspective, as they think it is not important. 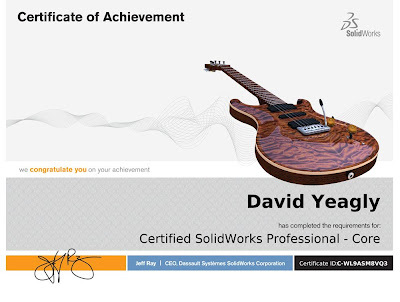 As for self-learner of SolidWorks, their designing objective is to get it done. 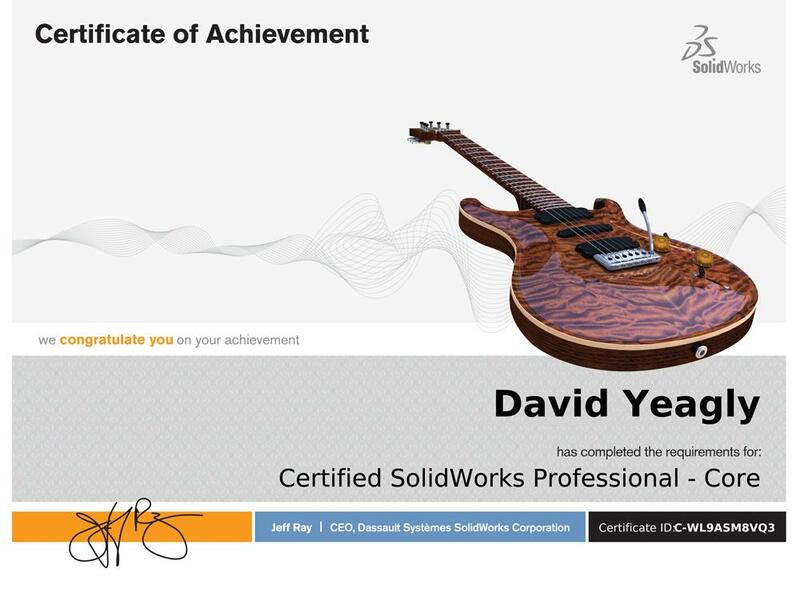 But for people with CSWP, they had been train to use SolidWorks as the way it should works, and their designing objective is to get it done, properly! To get it done is only the matter of to complete the design, while ignoring the warning, error, under define dimensions, whatever the cause... just complete it. To get it done, properly means to complete the design, with no warning and error, and fully define dimensions and prepared for future changes! Why this is crucial? The most obvious reason is time. By designing properly, is like a leaving a bread crumb on your trail. The designer can turn back, rewind back the time to exact where he wants to modify, so it later will reflect the outcome in the future/final design instantaneously. Great Scott! If just to make the design to be done and ended, the previous error will interfere during modification and may lead to more error as the designer didn't pay attention to warning earlier. Time will be lost for sure of this fixing relations and dimensions and in worse case, need to start back the design from scratch. For the last part, there may be an incident during work transition where the resigned guy, which in this case the self-learner with no CSWP may do the work half way done, and pass to the new recruit guy. Imagine this, if the resigned guys are much happy with his departure, chance that he left his work properly... is high. Else, get ready for truck load design error, undefined mate, missing linking part to assembly and other god forbid situation, depending how piss of that resigned guy with the company. Again, CSWP personnel is well prepare for this, they know what to do as error correction have been bread and butter for them. They can fix it and continue the past work flawlessly. Hiring a CSWP person means that you are hiring designer that well compliance with industries standard, so his job can be pass on to everyone else without the hassle dealing non-proper designing method. You will receive a "Certified SolidWorks Professional" certificate, which is suitable for framing of course. In addition, an email that directs you to our electronic certificate access page. 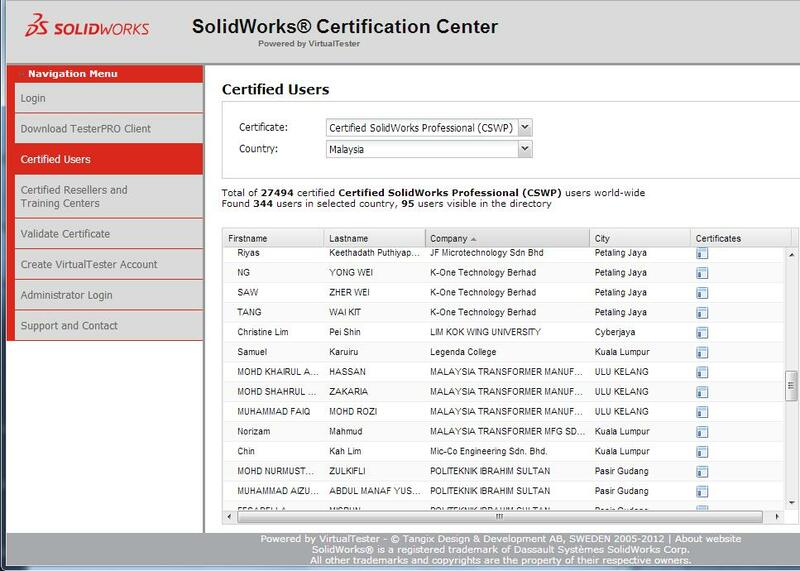 There you can login and download your electronic certificate and electronic business card logo); CSWP’s also receive discounts to partner products and SolidWorks World events. 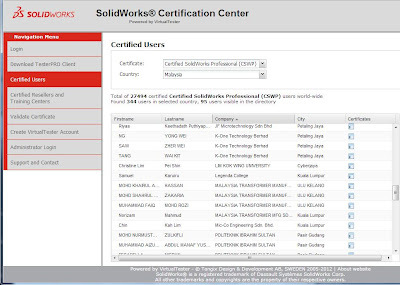 SolidWorks Corporation will also add your name to a web-based directory of Certified SolidWorks Professionals, which serves as a reference to instantly establish your credentials. So, what you waiting for? There are total of 17494 certified CSWP worldwide and now 344 CSWP holders in Malaysia, and growing. Don’t get left behind in this competitive challenging designing world. Act now and get yourself a CSWP to secure your future. Meanwhile, maybe you would like to join our “Let's Be CSWP together” program. More info, call us at 1300-88-2797. Show me a good web sites that contains all the images of the components in a mechanical part.